This project works with 18th scores, made in madeira embroidery, wich is an important hand made craft of Madeira Island, where Ana Irene Rodrigues and Sara Anjo are natives. Madeira Embroidery has been a part of the culture and history of the island since the beginning of times, in XIV century. It had an enormous social and economic affect for most Madeira families. It was one of the first and most important profession for the women of the island. In 1863, as home industry, the embroidery “employed” around 1029 woman. In 1906 this number raised up to 32.000, in 1940 to 50.000. The highest number was in 1950 with 60.000. Nowadays, the number is much smaller and its directed to an elder generation. Initially, it was an independent and creative process made exclusively by the embroider. 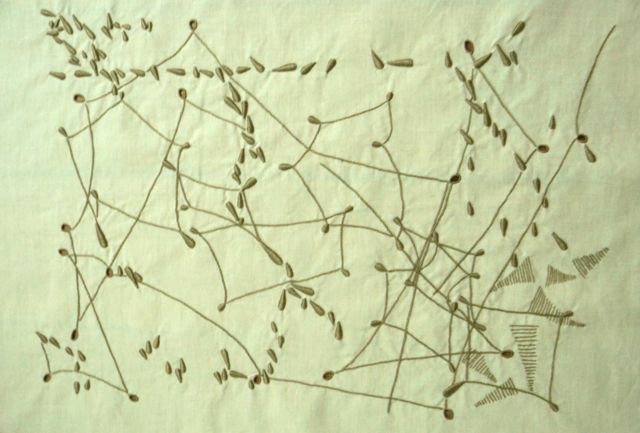 She had the responsibility of drawing the embroider, making its preparation, and fulfilling the process. In the XIX century with the industrialization, the process was modified subdividing the different tasks by several artisans (drawer, embossing, shredder, embroiderer, etc) and the embroidery became a high mercantile product, consequently taking its artistic value aside. In this way, this project aims to encourage madeira embroidery, expanding it as an artistic object. It also aims to reinforce its value as a feminine profession to be explored and developed by the younger generations.